I am testing a device with a 2700 series analyzer. Can I record a .wav file using the 2700 that I can play back later to hear the device’s output? You can export an acquired waveform to a .wav file from any of the SYS-2700 series analog or digital inputs, including the PSIA digital serial I/O. 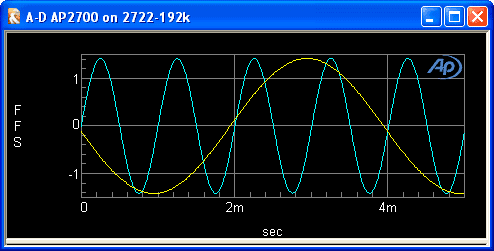 To do so, you first need to acquire a waveform using the FFT analyzer. In the Digital Analyzer panel, set the Analyzer control to FFT spectrum analyzer (fft). Then, set the FFT control to specify the desired FFT transform buffer length and the Acquire control to specify the desired FFT acquisition buffer length. If you want to record a signal that is longer than that needed to produce the FFT, change the Acquire control from Track FFT to the desired value. System Two and System Two Cascade instruments are limited to 256k. System Two Cascade Plus and 2700 series instruments have a 4M maximum buffer length. After the signal has been acquired, navigate to File > Export > WAV file to bring up the Export MS (.wav) Waveform dialog. Here you may select either the transform buffer or the acquisition buffer. Export MS (.wav) Waveform dialog. If Transform is selected, and the “Use instrument defaults” checkbox is checked, the exported .wav file will contain the number of samples specified by the FFT transform buffer length control on the Digital Analyzer panel. If this checkbox is not checked, and the number of samples entered in the adjacent text box exceeds the length of the transform buffer, copies of the transform buffer will be appended to itself as required to make up the total number of samples specified. As a result, if the waveform is not synchronous with the transform buffer, the exported .wav file could have glitches or discontinuities at the points where the waveform repeats. If Acquisition is selected, the exported .wav file will contain approximately the number of samples specified by the Acquire control on the Digital Analyzer panel.